Remembrance Day – also known as Poppy Day, Armistice Day (the event it commemorates) or Veterans Day – is a day to commemorate the sacrifices of members of the armed forces and of civilians in times of war, specifically since the First World War. It is observed on November 11 to recall the end of World War I on that date in 1918—major hostilities were formally ended at the eleventh hour of the eleventh day of the eleventh month of 1918 with the German signing of the Armistice. The holiday is marked by ceremonies at local war memorials, involving the laying of wreaths of poppies on the memorials and two-minutes' silence at 11A.M. After World War II the name of the holiday was changed to Veterans Day in the United States and to Remembrance Day in countries of the British Commonwealth of Nations and the commemoration extended to include veterans of that and later wars. 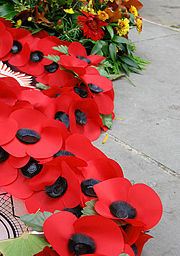 "Poppy Day" is also a popular term used, particularly in Malta and South Africa, due to the connection of poppies with the day, an association that derives from the poem In Flanders Fields that described poppies growing among the crosses marking the graves of those who died in World War I. On Remembrance Day, public readings of this poem stress our debt to those who lost their lives as well as the importance of honoring their memory in ceremonies that focus on the sacrifice and sorrow of war. Remembrance Day is the anniversary of the symbolic end of World War I on November 11, 1918. It commemorates the armistice signed between the Allies and Germany at Rethondes, France, for the cessation of hostilities on the Western Front, which took effect at eleven o'clock in the morning — the "eleventh hour of the eleventh day of the eleventh month." While this official date to mark the end of the war reflects the cease fire on the Western Front, hostilities continued in other regions, especially across the former Russian Empire and in parts of the old Ottoman Empire. The day was specifically dedicated by King George V, on November 7, 1919, to the observance of members of the armed forces who were killed during war. Tomb of an American soldier who died 11/11/1918, in France. Cimetière américain de Romagne-sous-Montfaucon. In many parts of the world people take a two-minute moment of silence at 11:00A.M. as a sign of respect for the roughly 20 million who died in the war. In 1920 and 1921, unknown soldiers from World War I were buried in London and Paris, as well as in Arlington National Cemetery in Virginia. Annual Remembrance Day ceremonies include the laying of wreaths at these venerated tombs, which are continually guarded. Common British, Canadian, South African, and ANZAC traditions include two minutes of silence at the eleventh hour of the eleventh day of the eleventh month (11:00A.M., November 11), as that marks the time (in the United Kingdom) when the armistice became effective. Beginning in 1939, the two-minute silence was moved to the Sunday nearest November 11, in order not to interfere with wartime production should November 11 fall on a weekday. Since the 1990s, a growing number of people have observed a two-minute silence on November 11, resulting in both Armistice Day and Remembrance Sunday being commemorated formally in the UK (although in 2007 they fell on the same day). The Service of Remembrance in many Commonwealth countries generally includes the sounding of Last Post, followed by the requisite two minutes of silence, followed again by the sounding of Reveille (or, more commonly, The Rouse), and finished by a recitation of the Ode of Remembrance. The Flowers of the Forest, O Valiant Hearts, I Vow to Thee, My Country, and Jerusalem are often played during the service. Services also include wreaths laid to honor the fallen, a blessing, and national anthems. For Anglican and Roman Catholics, there is a coincidental but appropriate overlap of Remembrance Day with the feast of St. Martin of Tours, a saint famous for putting aside his life as a soldier and turning to the peace-filled life of a monk. Statues or images associated with Saint Martin are for this reason sometimes used as symbols of Remembrance Day in religious contexts. Memorials outside London's Westminster Abbey for Remembrance Day, 2002. 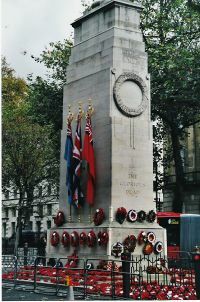 The Cenotaph on Whitehall, London, in November 2004 with wreaths laid down on Remembrance Day. In the United Kingdom, Remembrance Sunday is the second Sunday of November, the Sunday nearest to November 11 (Remembrance Day), which is the anniversary of the end of the hostilities of the First World War. The holiday is marked by ceremonies at local war memorials in most cities, towns, and villages, attended by civic dignitaries, ex-servicemen, and women. Wreaths of poppies are laid on the memorials and two-minutes' silence is held at 11A.M., recognizing the time the war ended in 1918. Church bells are usually rung half-muffled, creating a somber effect. The national ceremony is held at the Cenotaph on Whitehall, London and, since 2005, also at the Women's Memorial. Wreaths are laid by the leading members of the British Royal Family, the Prime Minister, leaders of major political parties, the Foreign Secretary, the Commonwealth High Commissioners and representatives from the Army, Navy, and the Royal Air Force, the Merchant Navy and fishing fleets, and the Civilian Services. Two minutes' silence is held at 11A.M., before the laying of the wreaths. The silence represents the eleventh hour of the eleventh day of the eleventh month in 1918, when the guns of Europe fell silent. This silence is marked by the firing of a field gun on Horse Guards Parade to begin and end the silence, followed by Royal Marines buglers, playing the Last Post. The event consists of an extensive march past, with army bands playing live music, each year following the list of the Traditional Music of Remembrance. Other members of the British Royal Family watch from the balcony of the Foreign Office. After the Ceremony, a parade of veterans, organized by the Royal British Legion, marches past the Cenotaph, each section of which lays a wreath as it passes. 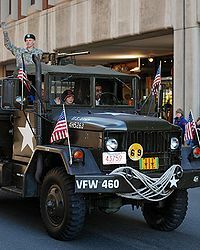 The VFW represented at the Veteran's Day Parade in Boston on November 11, 2007. United States President Woodrow Wilson first proclaimed an Armistice Day for November 12, 1919. The United States Congress passed a concurrent resolution seven years later on June 4, 1926, requesting the President issue another proclamation to observe November 11 with appropriate ceremonies. An Act (52 Stat. 351; 5 U. S. Code, Sec. 87a) approved May 13, 1938, made November 11 in each year a legal holiday: "a day to be dedicated to the cause of world peace and to be thereafter celebrated and known as 'Armistice Day'." In 1953, an Emporia, Kansas, shoe-store owner named Al King had the idea to expand Armistice Day to celebrate all veterans, not just those who served in World War I. King had been actively involved with the American War Dads during World War II. He began a campaign to turn Armistice Day into "All" Veterans Day. The Emporia Chamber of Commerce took up the cause after determining that 90 percent of Emporia merchants as well as the Board of Education supported closing their doors on November 11, 1953, to honor veterans. With the help of then-U.S. Rep. Ed Rees, also from Emporia, a bill for the holiday was pushed through Congress. President Dwight Eisenhower signed it into law on May 26, 1954. Congress amended this act on November 8, 1954, replacing "Armistice" with Veterans, and it has since been known as Veterans Day. Commemorated in the United States on November 11, it is both a federal holiday and a state holiday in all states. However, the function of the observance elsewhere is more closely matched by Memorial Day in May. Most schools, particularly more middle and high schools than some elementary schools, throughout the U.S. usually hold assemblies on a school day prior, with various presentations recognizing teachers and staff members who served in one of the five branches of the United States Armed Forces, as well as remembering the U.S. troops who died in past and present wars, and some patriotic music by a school choir, band, and/or orchestra, including songs from a musical used as a tribute to the troops (such as "Bring Him Home" from Les Misérables). In Australia Remembrance Day is always observed on November 11, although the day is not a public holiday. Services are held at 11:00A.M. at war memorials in suburbs and towns across the country, at which Last Post is sounded by a bugler and a one-minute silence is observed. In recent decades, however, Remembrance Day has been partly eclipsed by ANZAC Day (April 25) as the national day of war commemoration. 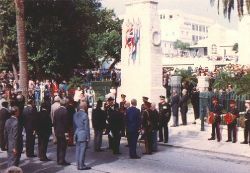 Remembrance Day Parade, Hamilton, Bermuda, 1991. In Bermuda, which sent the first colonial volunteer unit to the Western Front in 1915, and which had more people per capita in uniform during the Second World War than any other part of the Empire, Remembrance Day is still an important holiday. The parade in Hamilton had historically been a large and colorful one, as contingents from the Royal Navy, British Regular Army, the local Territorial units, the Canadian Forces, the U.S. Army, Air Force, and Navy, and various cadet corps and other services were all contributed at one time or another to march with the veterans. Since the closing of British, Canadian, and American bases in 1995, the parade has barely grown smaller. In addition to the ceremony held in the City of Hamilton on Remembrance Day itself, marching to the Cenotaph (a smaller replica of the one in London), where wreathes are lain and orations made, a smaller military parade is also held in St. George's on the nearest Sunday to Remembrance Day. In Canada, Remembrance Day is a holiday for federal government employees; for private business, provincial governments, and schools. The status of the holiday varies by province; in Ontario and Quebec it is a official provincial-wide holiday, in Western Canada and Atlantic Canada it is a general holiday. Corporations that are federally registered may make the day a full holiday, or instead, designate a provincially recognized holiday on a different day. 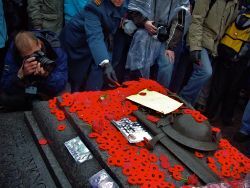 Poppies are laid on the Tomb of the Unknown Soldier on Remembrance Day in Ottawa. The official national ceremonies are held at the National War Memorial in Ottawa, presided over by the Governor General of Canada, any members of the Canadian Royal Family, the Prime Minister, and other dignitaries, to the observance of the public. Typically, these events begin with the tolling of the Carillon in the Peace Tower, during which serving members of the Canadian Forces arrive at Confederation Square, followed by the Ottawa diplomatic corps, Ministers of the Crown, special guests, the Royal Canadian Legion (RCL), the vice-regal party, and, if present, the royal party. Before the start of the ceremony, four armed sentries and three sentinels – two flag sentinels and one nursing sister – are posted at the foot of the cenotaph. The arrival of the Governor General is announced by a trumpeter sounding the Still, whereupon the viceroy is met by the Dominion President of the RCL and escorted to a dais to receive the Vice-Regal Salute, after which the national anthem, O Canada, is then played. The moment of remembrance begins with the bugling of Last Post immediately before 11:00A.M., at which time the gun salute fires and the bells of the Peace Tower toll the hour. Another gun salute signals the end of the two minutes of silence, and cues the playing of a lament, and then the bugling of The Rouse. A flypast of Canadian Air Command craft then occurs at the start of a 21 gun salute, upon the completion of which a choir sings In Flanders Fields. The various parties then lay their wreaths at the base of the memorial; one wreath is set by the Silver Cross Mother, the most recent recipient of the Memorial Cross, on behalf of all mothers who lost children in any of Canada's armed conflicts. The royal and/or vice-regal group return to the dais to receive the playing of the Royal Anthem of Canada, God Save the Queen, prior to the assembled Armed Forces personnel and veterans performing a March Past in front of the royal and/or viceregal persons, bringing about the end of the official ceremonies. A tradition of paying more personal tribute to the sacrifice of those who have served and lost their lives in defense of the country has emerged since erection of the The Tomb of the Unknown Soldier at the War Memorial in 2000. After the official ceremony the general public pay their respects by placing their poppies atop the Tomb. The military Remembrance Day parade in Ottawa. Similar ceremonies take place in provincial capitals across the country, officiated by the relevant Lieutenant Governor, as well as in other cities, towns, and even hotels or corporate headquarters. Schools usually hold special assemblies for the first half of the day, or on the school day prior, with various presentations concerning the remembrance of the war dead. One of the largest indoor ceremonies is held in Saskatoon, Saskatchewan, with over 9,600 gathering in Credit Union Center in 2015. The ceremony participants include old guard (veterans), new guard (currently serving members of the CF), and sea, army, and air cadet units. Armistice Day is celebrated in France. It commemorates the armistice signed between the Allies and Germany at Compiègne, France, for the cessation of hostilities on the Western Front, which took effect at eleven o'clock in the morning—the "eleventh hour of the eleventh day of the eleventh month." New Zealand's national day of remembrance is Anzac Day, April 25. "Poppy Day" usually occurs on the Friday before Anzac Day. Services are also held on November 11, which is generally referred to as Armistice Day. In the Republic of Ireland, Armistice or Remembrance Day is not a public holiday. In July there is a National Day of Commemoration for Irish men and women who died in past wars or on service with the United Nations Peacekeeping Forces. Remembrance Day is observed by the Republic’s citizens who are serving or who have served in the British Armed Forces. The Irish National War Memorial Gardens is an Irish war memorial in Dublin dedicated to the memory of the 49,400 Irish soldiers who were killed in action in World War I.
Remembrance Sunday, November 11, is marked in the Republic by ceremonies held across the country. The President of Ireland attends the ceremony in St Patrick’s Cathedral, Dublin. In South Africa, Poppy Day is not a public holiday. It takes place on the Saturday nearest to Remembrance Day, though in Cape Town a Remembrance Service is still held on November 11 each year. Commemoration ceremonies are usually held on the following Sunday, at which the Last Post is played by a bugler followed by the observation of a two-minute silence. The two largest commemoration ceremonies to mark the event in South Africa are held in Johannesburg at the Cenotaph, and at the War Memorial at the Union Buildings in Pretoria. Many high schools hold Remembrance Day services to honor the past pupils who died in the two World Wars and the Border war. In addition, the South African Legion holds a street collection to gather funds to assist in the welfare work among military veterans. 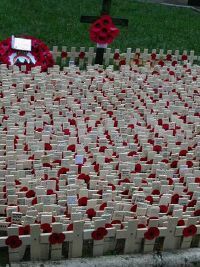 Wreaths of artificial poppies used as a symbol of remembrance. The poppy's significance to Remembrance Day is a result of Canadian military physician John McCrae's poem In Flanders Fields. The poppy emblem was chosen because of the poppies that bloomed across some of the worst battlefields of Flanders in World War I, their red color an appropriate symbol for the bloodshed of trench warfare. An American YMCA Overseas War Secretaries employee, Moina Michael, was inspired to make 25 silk poppies based on McCrae's poem, which she distributed to attendees of the YMCA Overseas War Secretaries' Conference. She then made an effort to have the poppy adopted as a national symbol of remembrance, and succeeded in having the National American Legion Conference adopt it two years later. At this conference, a Frenchwoman, Anna E. Guérin, was inspired to introduce the widely used artificial poppies given out today. 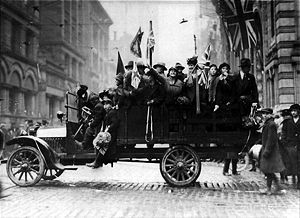 In 1921, she sent her poppy sellers to London, where they were adopted by Field Marshall Douglas Haig, a founder of the Royal British Legion, as well as by veterans' groups in Canada, Australia, and New Zealand. Some people choose to wear white poppies, which emphasizes a desire for peaceful alternatives to military action. In Canada, the poppy is the official symbol of remembrance worn during the two weeks prior to November 11, after having been adopted in 1921. 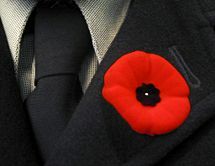 The Canadian poppies consist of two pieces of molded plastic covered with flocking with a pin to attach them to clothing. The head portion of the pin is bent at an angle in a simple unusual design that requires a unique machine at manufacturing. Originally the poppies were manufactured with a black center based on the 1922 design. From 1980 to 2002, the centers were changed to green to represent the green hills of Flanders. Current designs are black only; this reversal caused notable confusion and controversy to those unfamiliar with the original design. In 2007, sticker versions of the poppy were developed for children, the elderly, and health-care and food-industry workers. The stickers were not designed to replace the lapel pin poppies, but merely to allow those who could not normally wear one to do so safely. In England, Wales, and Northern Ireland the poppies are paper representatives of the flat Earl Haig variety with a leaf, mounted on a plastic stem. Wearers require a separate pin to attach the poppy to their clothing. In Scotland the poppies are curled at the petals with no leaf. In Northern Ireland, because the poppy honors soldiers of the British Armed Forces and because of The Troubles, it is worn primarily by members of the Unionist and the Irish Protestant community. 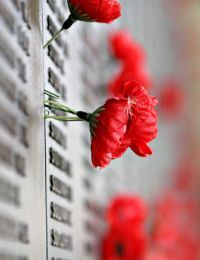 Poppies placed in the wall panels of the Australian War Memorial on Remembrance Day. In Australia and New Zealand, the poppies are curled at the petals with no leaf. In Sri Lanka in the inter-war years, there were rival sales of yellow Suriya (portia tree) flowers by the Suriya-Mal Movement on Remembrance Day, since funds from poppy sales were not used for Sri Lankan ex-service personnel, but were repatriated to Britain. However, nowadays poppy sales are used for indigenous ex-service personnel who have been disabled in the ongoing civil war. In the United States, the American Legion distributes crepe-paper poppies in exchange for contributions. "Poppy Day" is usually the same as or near Memorial Day in May. ↑ A Guide to Commemorative Services Veterans Affairs Canada. Retrieved November 11, 2018. ↑ Ninety Years of Remembrance BBC, 2008. Retrieved November 11, 2018. ↑ Veterans Day Facts 'A&E Television Networks. Retrieved November 11, 2018. ↑ History of Veterans Day The U.S. Army Center of Military History3. Retrieved November 11, 2018. ↑ Saskatoon honours veterans at annual ceremony Rawlco Radio Ltd., November 11, 2015. Retrieved November 11, 2018. ↑ Anzac Day Ministry for Culture and Heritage. Retrieved November 11, 2018. ↑ Anzac Day Page 9 – The red poppy Ministry for Culture and Heritage. Retrieved November 11, 2018. ↑ Armistice Centenary – 11 November 2018 Ministry for Culture and Heritage. Retrieved November 11, 2018. ↑ Soldiers Remembered In Cross Border Commemoration Northern Ireland News, November 3, 2008. Retrieved November 17, 2018. ↑ War Memorial Gardens Heritage Ireland. Retrieved November 17, 2018. ↑ Northern Ireland honours war dead BBC News, November 11, 2001. Retrieved November 17, 2018. ↑ 12.0 12.1 About the SA Legion South African Legion. Retrieved November 17, 2018. ↑ Where did the idea to sell poppies come from? BBC News, November 10, 2006. Retrieved November 17, 2018. ↑ Julia Skikavich, New sticker poppies are catching on CBC News, November 5, 2008. Retrieved November 17, 2018. ↑ The Poppy Story American Legion. Retrieved November 17, 2018. All links retrieved November 11, 2018. This page was last modified on 17 November 2018, at 23:49.